I went to see the advanced showing of The Death Cure with my 16-year-old daughter last Thursday. She is a fan. And by fan, I mean owns at least two sets of all the books (there is the trilogy and two prequels) along with two signed copies of book one. Went to the fan convention, GladerCon, for the series, and has seen The Death Cure two more times since last Thursday. 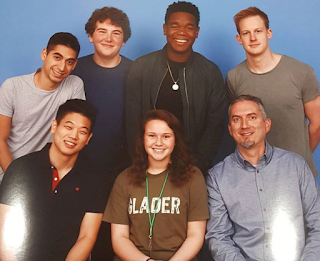 Here is a photo of Holly with cast members and James Dashner (the author of the books). 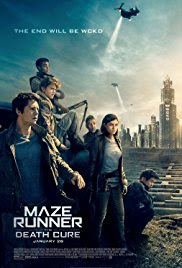 I enjoyed the first two movies (The Maze Runner and The Scorch Trials). The Death Cure was my favorite of the three. It started off at top speed and never slowed down. Lots of action and things blowing up. As a fan of the books, Holly says she is happy with how The Death Cure played out. Book fans were a little disappointed with the first two movies because some of the key scenes in the books had been left out, but The Death Cure made up for it. There were many nods at the book included along with some from Dashner's other series. If you like big action movie troupes (they use them all) then you will like this one. I don't think you have to see the first two to enjoy The Death Cure, but it wouldn't hurt. The first two have been showing on TV so you can catch them for free.